Bruck an der Glocknerstraße is a town in the Pinzgau area of Salzburg. Bruck is not to be confused with its namesake at the Mur river in Styria - thus the specification. With "Glocknerstraße", the name refers to the panorama road of Großglockner Hochalpenstraße, a road to the glaciers of Austria′s highest mountain. Bruck can be found at the northern entrance point to this road. It has a population of approximately 4,500. Tourism is very important for Bruck, but mostly for its gastronomy. Bruck is neither an outstanding skiing town (unlike neighbouring Maria Alm) nor a particularly popular base for hiking holidays - it is mostly people who come for the panorama road during the summer that fuel the local tourism facilities. After the Imperial Palace of Schloss Schönbrunn, the Großglockner Hochalpenstraße is Austria′s second-busiest sightseeing attraction. 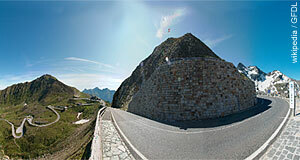 From Bruck to Heiligenblut in Carinthia, the panorama road is almost 50 kilometres long. It is a toll road and was completed in 1935. The area of Bruck itself was probably populated since the Bronze Age, initially by Illyrian tribes. Later, they mixed with Romans and even later with Bavarians. The first written record of Bruck can be dated to 1227. The current name "Bruck an der Glocknerstraße" was introduced after the construction work was finished - probably for marketing reasons. It worked: Today, Bruck is a busy village and a popular stop-over destination during the summer months.